MK 358 Social Media is using their Twitter skills to contact Chris Evans. 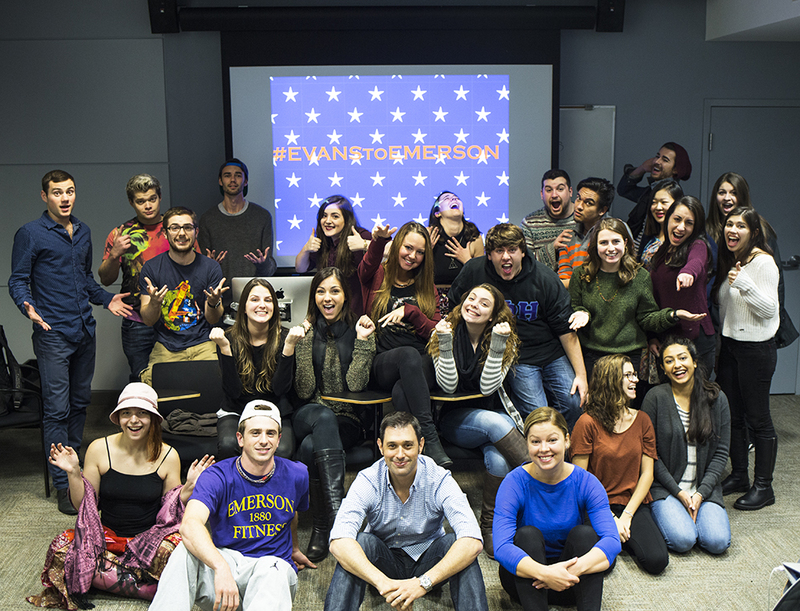 An Emerson class is running a social media campaign to bring a major celebrity to campus. The goal of #EvanstoEmerson is to get Chris Evans, actor and Boston native, to speak on Nov. 12 for Mental Health Wellness Week. The professor of the MK 358 Social Media class, David Gerzof Richard, said that the campaign demonstrates of the value of social media and how it’s used differently in advertising and public relations. In previous years, Richard’s class has gotten the attention of New England Patriots players Chad Johnson, Rob Gronkowski, and Julian Edelman. Johnson took the class out to the All Star Sandwich Bar in 2011. Both Gronkowski and Edelman each spoke to the class on campus, with Edelman also providing hamburgers for the students. The decision to target an actor was made by this year’s students. Junior Alyssa Harberger, a member of the class, said that the students started by suggesting several different celebrities. The class criteria stated that the person had to be connected to the Boston area and accessible through social media. Evans is frequently in the city to visit family, but he doesn’t have a set schedule for being here. Sean Mack, a senior marketing communication major in the class, said this makes their campaign a little more challenging and time sensitive. Evans has spoken about his struggle with anxiety in the past, which led the students to select him as a good candidate to speak about mental health. In an article published in The New York Times, Evans discussed the impact that anxiety has had on his career, specifically his role as Captain America in the Marvel Cinematic Universe franchise. “Bringing Captain America to talk to us about anxiety would be pretty amazing,” Mack said. Richard said using social media allows students to avoid “gatekeepers,” a term that includes publicists, managers, and anyone else who prevents direct contact with the desired target. The class has monitored Evans’ activity on Twitter. They quickly realized that Evans is a huge Patriots fan and is very active during games. Another way the class has tried to get his attention is through Dubsmash, an app which allows users to make lip-sync videos to a variety of songs and sounds. Ashley Sousa, a senior marketing communication and writing, literature and publishing double major, said the class has shown her how useful social media is for businesses and individuals. Richard said that the class is currently still at the awareness stage of the campaign. To complete the next step, Evans has to acknowledge the campaign. Then they plan to make their purpose clear to the audience and convert the conversation into something tangible. “You never know how it’s going to bounce around the Internet and land into his lap,” he said.